Photos taken November 24-26, 2006. All traffic is currently on the future northbound structure. 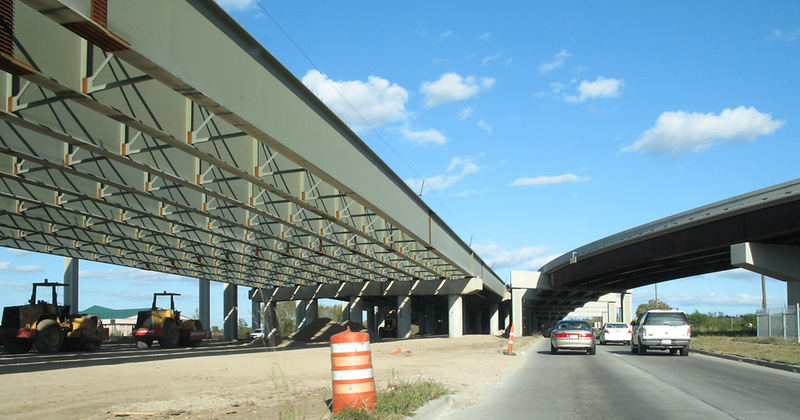 The original southbound structure is mostly demolished, and the original northbound structure is about 40% demolished. (high resolution) This view looks north from Galveston Island, showing the remains of the original bridges. 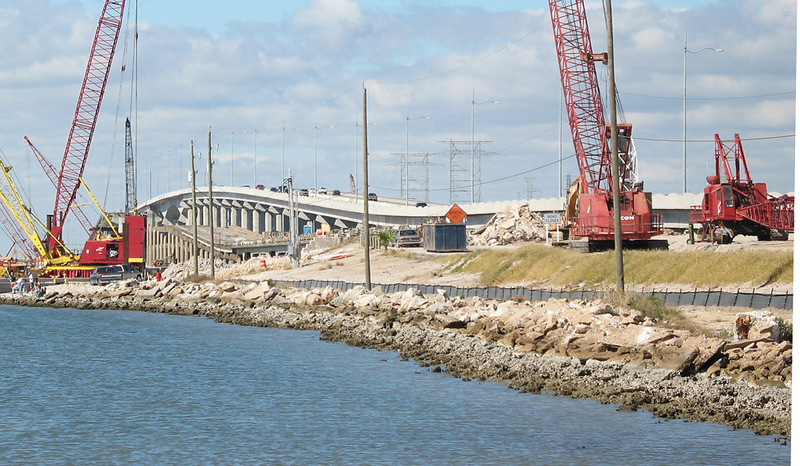 The southern support for the second cast-in-place concrete bridge over the intracoastal waterway is complete. (high resolution) This view is similar to the one above. 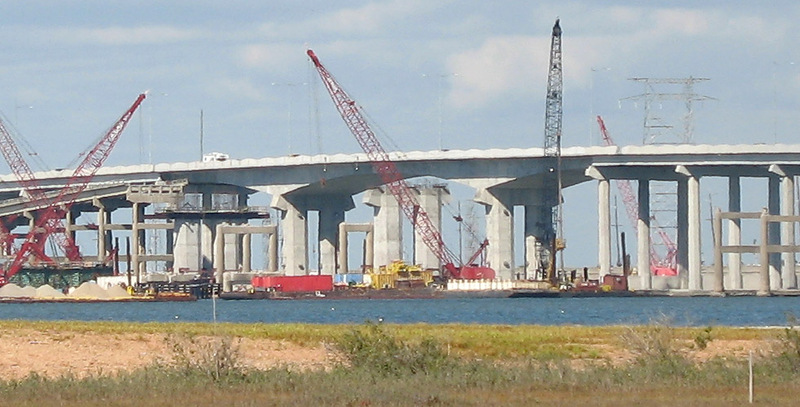 This is a zoomed view of the main span over the intracoastal waterway. (high resolution) This view shows the south end of the bridge and what remains of the original northbound span. (high resolution) This view shows the north half of the bridge. The original northbound span is still mostly intact. 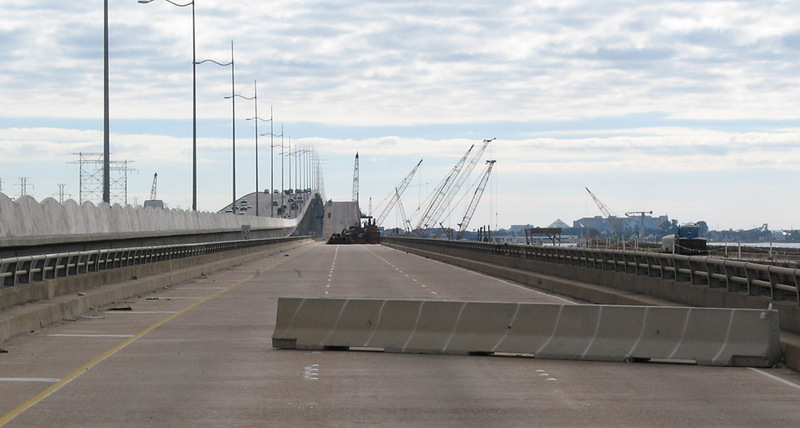 The original southbound span has had its high level section demolished, but the low-level span is still intact. 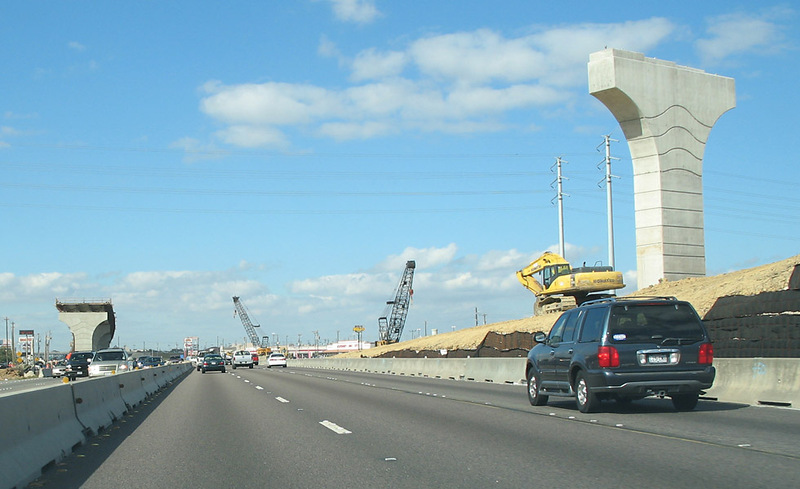 (high resolution) This view looks northwest (northbound) from Galveston Island, showing the active construction zone. Driver's view going northbound toward the mainland. Driver's view going northbound at the north end of the bridge. 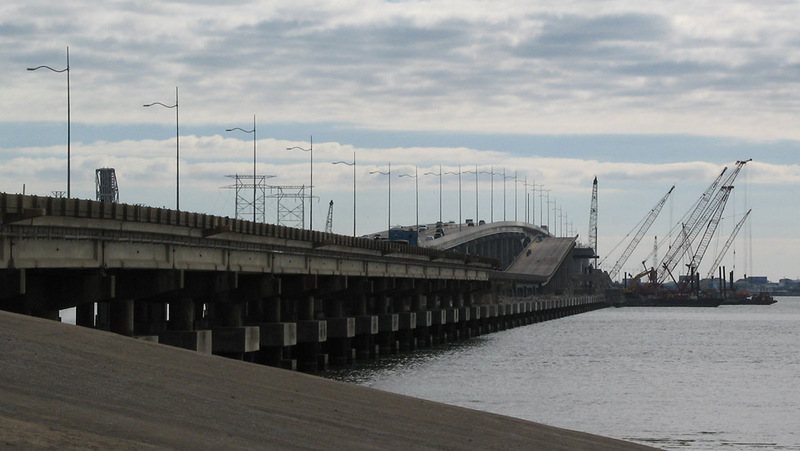 Looking southeast from the mainland, showing what remains of the original bridges. This view looks southeast along the original northbound structure, showing that most of the elevated section of the northbound structure is still intact but the elevated section of the original southbound structure is gone. This is the newly-complete main lanes of Interstate 610 (West Loop) northbound at the Katy Freeway. The exits to the Katy Freeway are on the right. 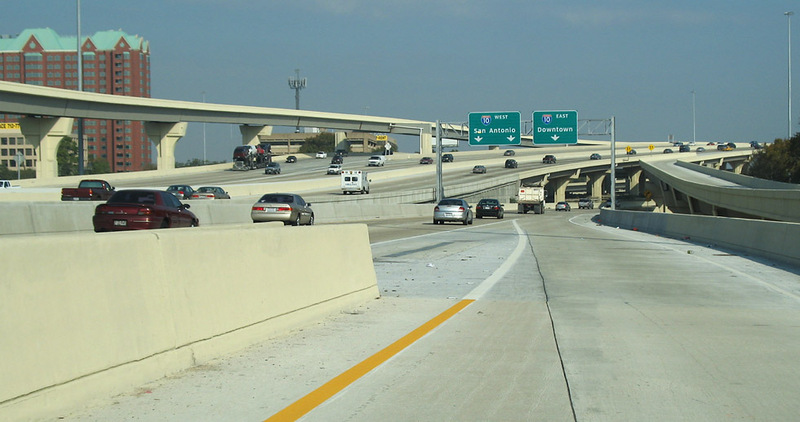 Approaching the Katy Freeway on the West Loop exit lanes. This is driving westbound on the Katy Freeway approaching the West Loop interchange. 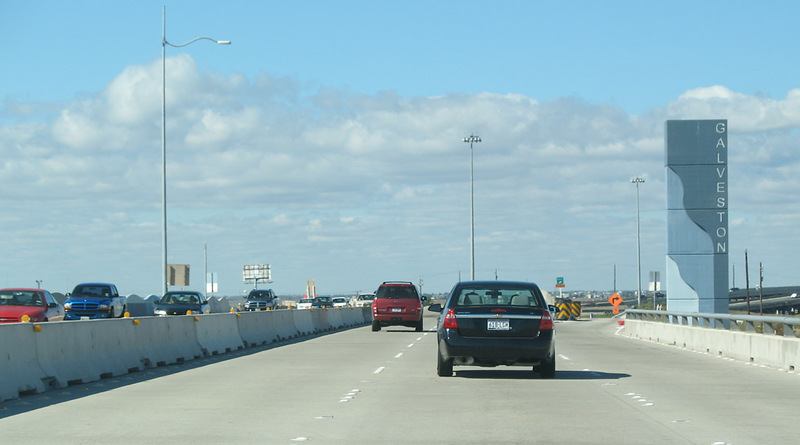 Driving westbound on the Katy Freeway at the West Loop interchange. This is the Silber exit just west of Loop 610. The new westbound main lanes are under construction on the right, and all traffic is currently on the original lanes on the left. Driver's view going westbound at Antoine. Traffic is on the original lanes. The new westbound lanes are being built on the right. To the left, a large clear right-of-way is visible for the future eastbound frontage roads and main lanes. 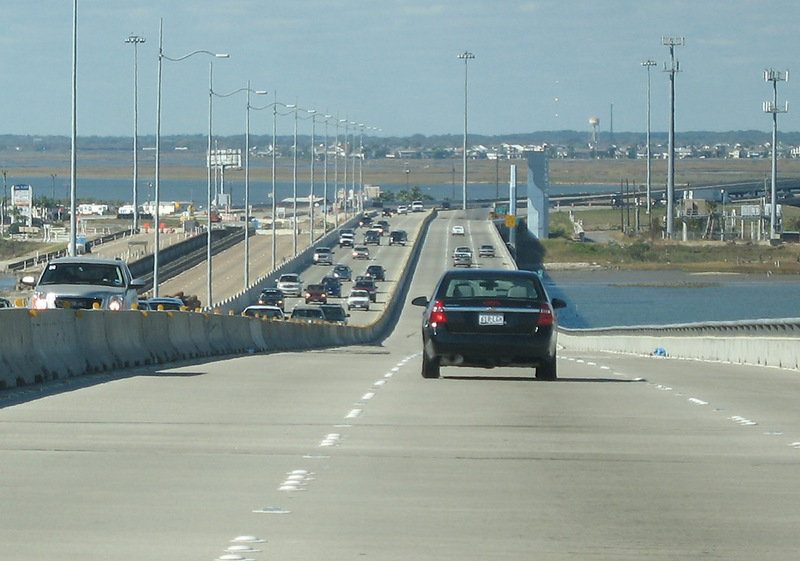 The toll lanes will be approximately in the location of the current main lanes. (high resolution) This view looks west at Chimney Rock. On the right a new 175-foot-tall mast has been installed. The original 125-foot masts on the left will be replaced by 175-foot-masts. This view looks west at Bunker Hill on the north side of the freeway, showing cleared right-of-way for the westbound frontage roads. 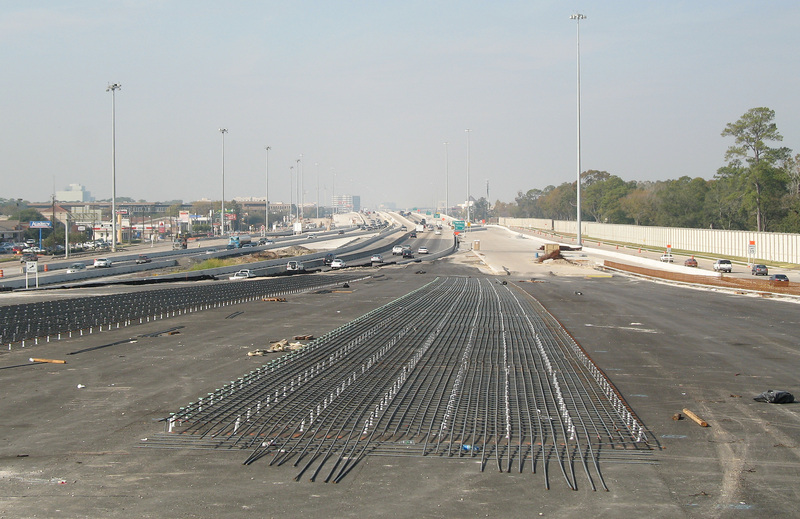 This is at Beltway 8 interchange, looking west at the northwest side of the interchange. 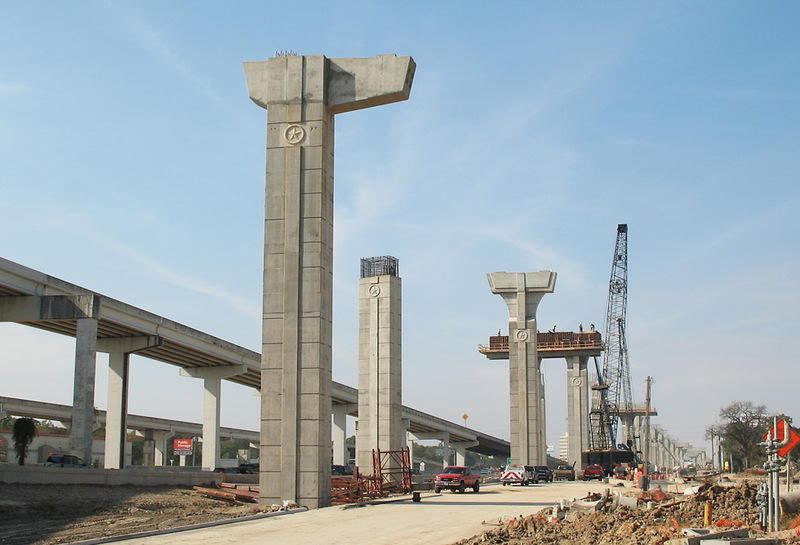 These piers are for the ramp for northbound Beltway 8 to westbound Katy Freeway traffic. The same piers as the previous photo. 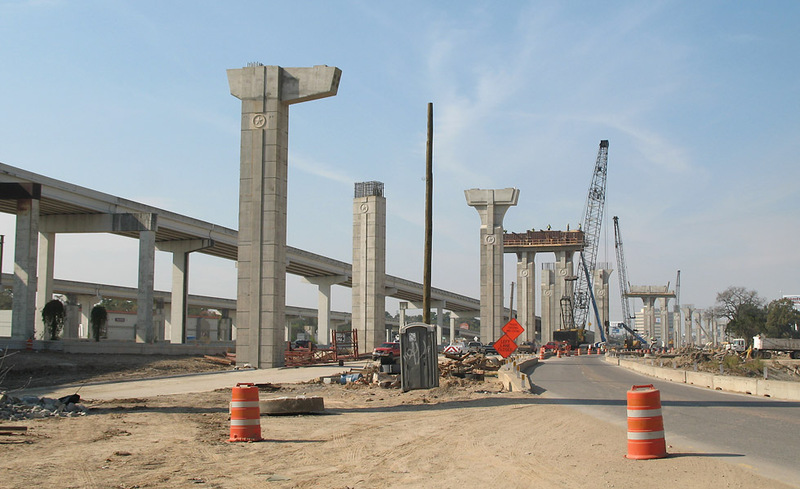 Driving west along the Katy Freeway frontage road, showing piers for the long ramp. This view is northbound on I-45, approaching the NASA 1 construction zone. There will be two direct-connect ramps to NASA 1. I-45 is being widened to its ultimate size of 10 main lanes and 2 HOV lanes. Piers for the direct-connect ramp. 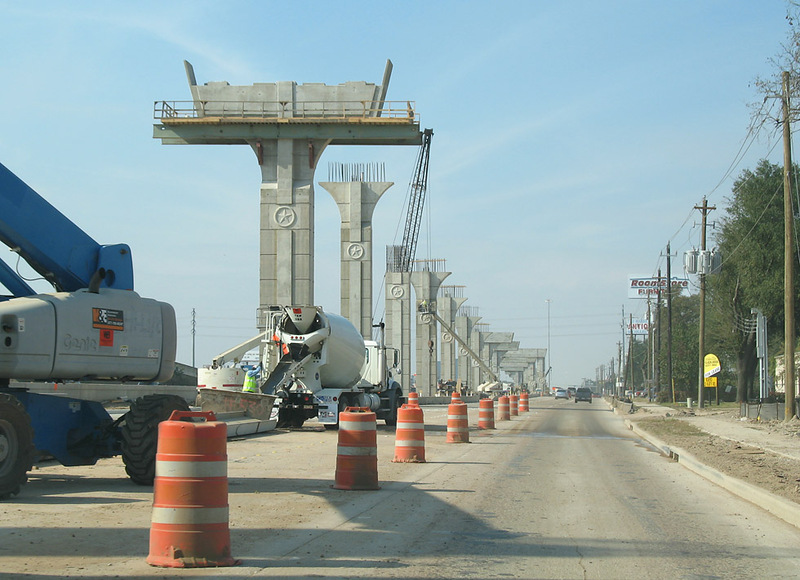 Work is nearing completion on the section from Beltway 8 to east of South Post Oak. The overpass at South Post Oak is now open. Driver's view going eastbound at Fondren. This view is east of Fondren and looks east. 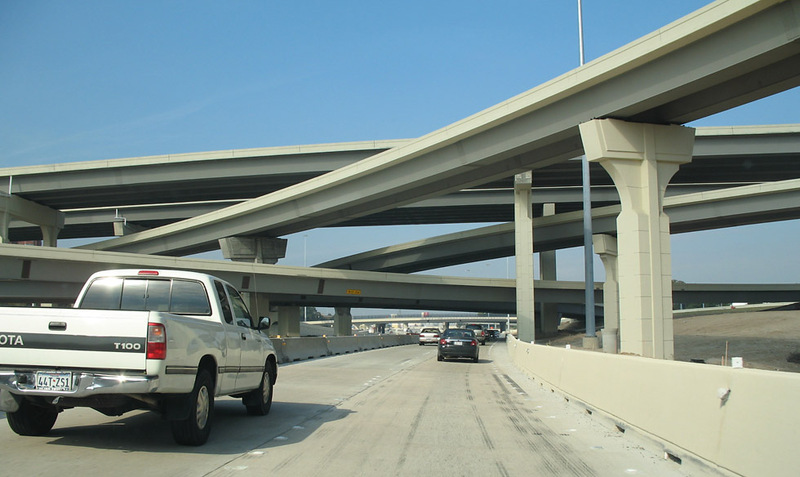 It shows the nearly-complete roadway and its configuration: 8 lanes between overpasses, with 6-lane overpasses at intersections. 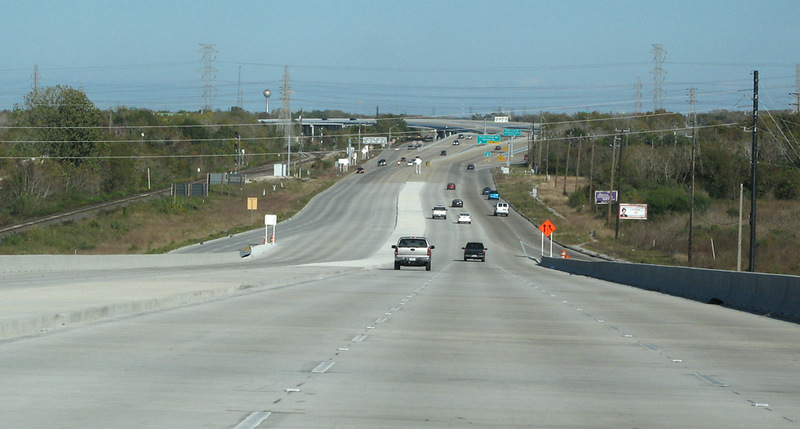 Approaching the Fort Bend Parkway Tollway, which terminates onto South Main. At the Fort Bend Parkway Tollway. 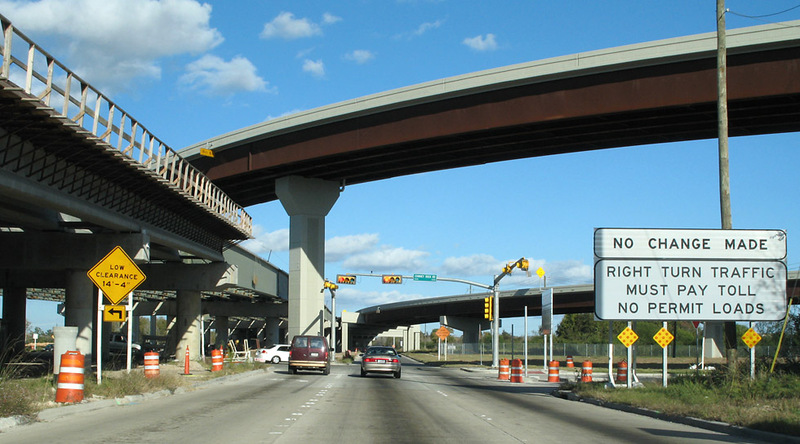 The South Main main lanes have a long steel overpass to accommodate the future main lanes of the Fort Bend Parkway, which will be trenched below grade. The overpass at South Post Oak is open. It goes over the elevated South Post Oak, making it quite high. View looking north from the bridge. On the downgrade. The previous completed section starts just ahead. 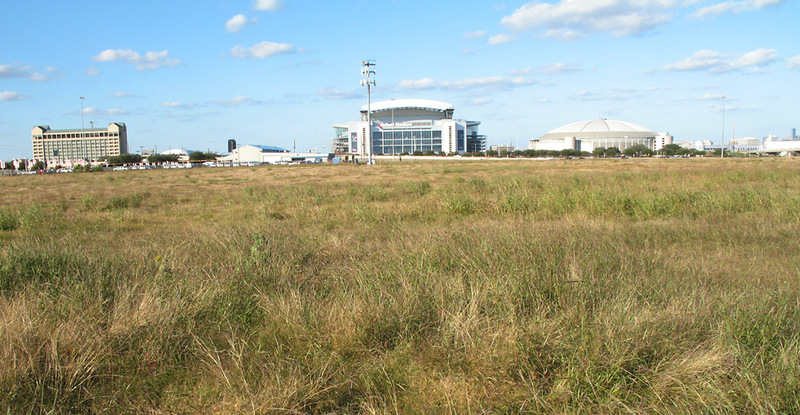 Demolition of Astroworld was completed several months ago and the site is now covered with grass. This view looks north over the property from Bellfort. This view looks northeast across the property. 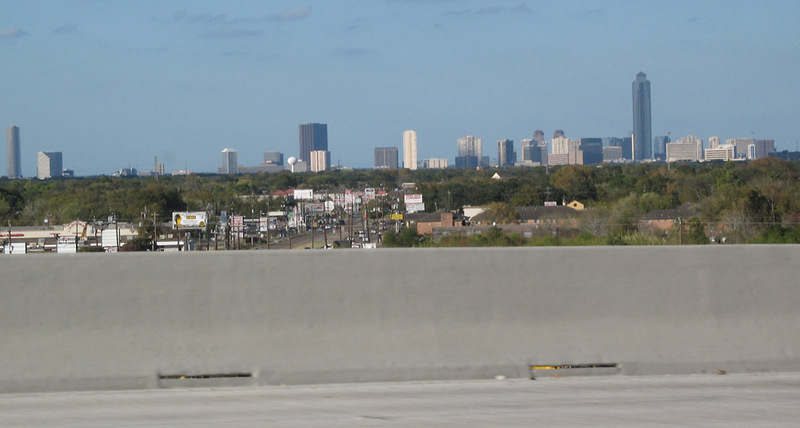 Loop 610 south is barely visible in the far background.